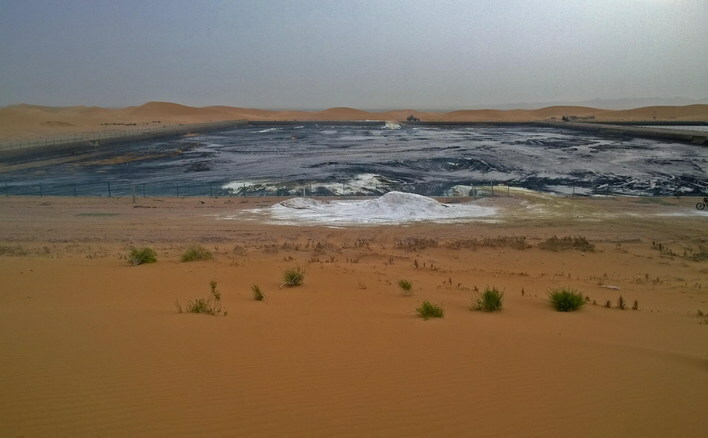 In 2015, eight companies were ruled to pay 569 million yuan for dumping untreated waste in the Tengger Desert between Inner Mongolia autonomous region and Gansu province, with a non-profit organization as the plaintiff. 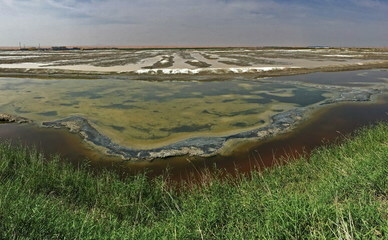 As early as 2010, the media exposed Ningxia Zhongye Meili Paper Co., Ltd., which discharged a large amount of wastewater from papermaking into the Tengger Desert, but it was not properly addressed after the exposure. There were about forty 180-metre-deep wells in the desert around Elisi, all supplying water to the chemical plants. 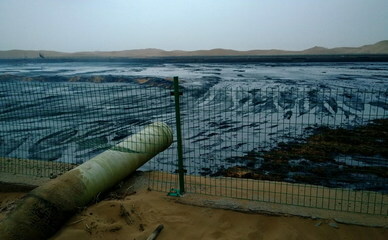 The reporter saw one well, numbered 31, marked as being the ’water supply for Qinghua Refined Chemicals Park'. The source pointed out the wire poles extending to the desert hinterland - each one leading to a similar well (as they have to use electricity). Every year the number and the depth of the wells increases. This report prompted a top-level investigation and sacking of provincial officials. In September 2014, the relevant departments of the Zhongwei Municipal Government of Ningxia ordered the enterprises to promptly start treatment and prevention process for the pollution and to study a solution to control pollution under the guidance of experts. At the same time, investigation and accountability procedures were set up. Later, on September 30, 2014, the Inner Mongolia Autonomous Region Government held an (expansion) meeting of the Standing Committee of the Communist Party to arrange the deployment of ecological protection in the whole district. On the following day, the Department of Environmental Protection in Inner Mongolia convened an emergency party group meeting to study and deploy the next key tasks. On December 14, 2014, some journalists went to the original sites and found that the sewage and sediment in the drying pool had been cleaned. There were no pollutants at the bottom. The surrounding sewage pipes were removed. 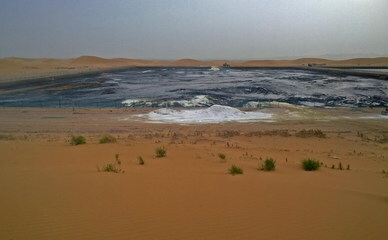 After the sewage and sediment were solidified, they were transferred to pool No. 4 to be sealed, and the pool No. 4 was also changed to a solidified landfill. Its surface has been paved with grass and there was no disgusting smell at the scene. According to the pictures taken by the reporter on August 29, 2014, there was black odorous sludge in the No. 1 drying pool, and a large amount of sludge accumulated in the No. 2 pool. By December 17, the sediment of the No. 1 drying pool had been cleaned and the bottom was a dry, non-polluted mud layer. The sludge at the bottom of No. 2 was removed and the enclosure was also removed. With a total investment of 46 million yuan, the solidified material disposal site was changed to No. 4 drying pool, and the sewage and sediment of No. 1, 2 and No. 3 were solidified and transported to the No. 4 drying pool for storage. Designed according to environmental protection requirements, the project has a progressive transfer of solidified material of 98,600 m2, and 53,000 m2 of grass after storage. The project was reviewed on November 28th by the expert group of Inner Mongolia Environmental Protection Department who approved it. .
On April 30, 2015, the first case was pronounced after the Tengger Desert pollution incident. The defendant Ningxia Mingsheng Dyeing Company was convicted of environmental pollution and was fined CNY 5 million (USD 724,638, USD 1=CNY 6.9). The defendant Lian was convicted of environmental pollution crime. He was sentenced to one year and six months in prison, suspended for two years, and fined CNY 50,000 (USD 7,246). 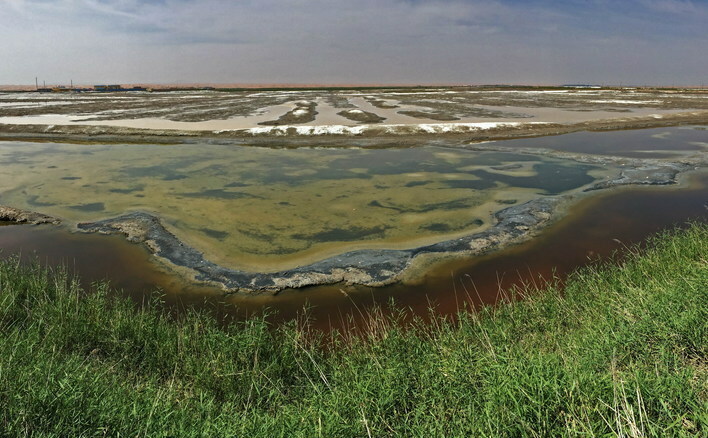 Since the Tengger Desert pollution problem occurred, Ningxia Zhongwei City has filed 8 investigations, 5 people are on bail pending trial, 1 is in administrative detention, and 15 public officials were ordered to take responsibilities because of lacking dereliction of duty. Among them, 9 are given disciplinary action and 6 are made checks and notified by criticism. 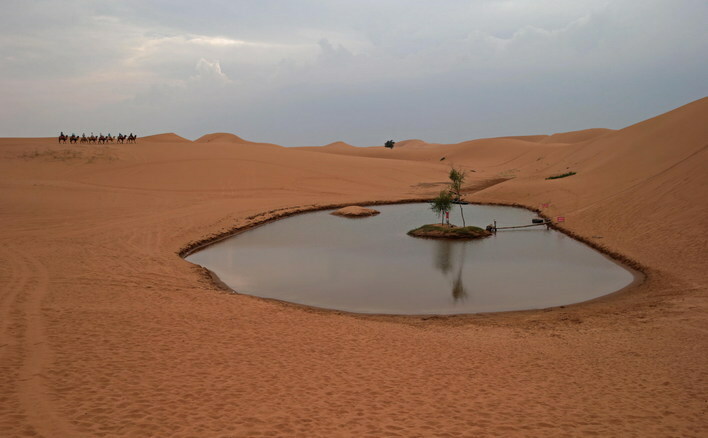 In 2015, when the China Biodiversity Conservation and Green Development Foundation, (hereinafter referred to as CBCGDF) visited the polluted areas of the Tengger Desert again, they found that the restoration work was not carried out well. On August 13, the CBCGDF and Wang Haijun, a lawyer of Deheheng Law Firm, filed an indictment with Zhongwei Intermediate People's Court in Ningxia Hui Autonomous Region (hereinafter referred to as Zhongwei Intermediate People's Court), and lodged a environmental public interest litigation against eight enterprises polluting the Tengger Desert. The environmental public interest litigation required the court to sentence and order the defendant to bear civil liability such as stopping the infringement, eliminating the danger, restoring the original condition, compensating for the loss, and apologising. On August 19 of the same year, Zhongwei Intermediate People's Court pointed out that the CBCGDF was not a suitable subject because its work on biodiversity conservation and green development did not belong to public welfare activities of environmental protection. On August 27, 2015, CBCGDF appealed to the Higher People's Court of Ningxia Hui Autonomous Region (hereinafter referred to as Ningxia Higher Court) on the subject qualification. On November 6, 2015, the Ningxia Higher Court ruled that the lawsuit of CBCGDF was rejected on the same grounds. On November 24, 2015, the CBCGDF filed a retrial application with the Supreme People's Court. On December 2, 2015, the Supreme People's Court officially filed a case for retrial application. On January 22, 2016, the Supreme People's Court made a civil ruling and decided to review 8 environmental public interest litigations in the Tengger Desert pollution. On January 28, 2016, the Supreme People's Court made a final ruling. The first and second rulings of the Tengger Desert Pollution Public Interest litigation case found that the CBCGDF did not have the qualification to file an environmental civil public interest litigation, which is related to the improper judicial interpretation and understanding of the Environmental Protection Law and the Environmental Public Interest litigation. Therefore, the original ruling should be corrected. In February 2016, after the final judgement of the Supreme People's Court, Zhongwei Intermediate People's Court accepted the application of CBCGDF that appealed to a total of 8 enterprises, which were Zhongwei Meiliyuan Water Co., Ltd., Ningxia Lanfeng Fine Chemical Co., Ltd., Ningxia Huayu Chemical Co., Ltd., Ningxia Desert Chemical Co., Ltd., Ningxia Zhongwei Dalong Chemical Technology Co., Ltd., Ningxia Ruitai Technology Co., Ltd., Ningxia Mingsheng Dyeing Co., Ltd., Zhongwei Xinsanyuan Chemical Co., Ltd., of public interest litigation for soil pollution damage compensation. On August 28, 2017, the Tengger Desert Pollution Public Interest Litigation case was settled by mediation. The eight polluting enterprises involved in the case should pay CNY 569 million (USD 82,463,768.1) for the restoration of the contaminated soil and for the prevention of polluting soil again, and another CNY 6 million (USD 869,565) to a public welfare fund for environmental damage . Project Details #There is no detailed information on the companies involved. Here we could only refer to name some of the companies and provide some information on the industrial parks. The information updated on July 7, 2015 shows that the enterprises in Tengger Industrial Park carry out production processes with nitrate, naphthalene, benzene, coal chemical and metallurgical raw materials as the main raw materials. The minerals used in large-scale mining mainly include salt, nitrate, iron, clay, and gypsum. In 2013, the total industrial output value was 670 million yuan, the operating income was 640 million yuan, and the tax was 0.14 billion yuan. Zhongwei Industrial Park consists of 5 industry sections including the papermaking and packaging printing industry, the coal chemical industry, the salt chemical industry, the natural gas chemical industry and the fine chemical industry of by-products extension development, the iron and steel smelting industry, the metal materials, the non-metal materials and the new material industry that mainly involves polymer materials. It also has four townships characteristic Zone, namely, Zhenluojinxin Industrial Zone, Xuanhe Metallurgical Chemical Zone, Changle Ceramic Industrial Zone and Ningxia Red Science and Technology Zone. In 2012, the total industrial output value was 11.4 billion yuan. It is estimated that by 2020, the accumulated investment of enterprises will reach 60 billion yuan, and the output value will reach 100 billion yuan. The compensation of 596 million yuan became the largest amount of compensation of environmental public interest litigation in China so far . Why? Explain briefly. Under the exposure of many media, the Tengger Desert pollution incident was highly concerned by the central government, so it could be resolved in time. Relevant enterprises and leaders were punished as they should. The compensation of 596 million yuan became the largest amount of compensation of environmental public interest litigation in China so far , which alarms the pollution behaviour of some enterprises. However, the better resolution of the incident relies mainly on the high concern of the Party Central Committee and the pressure of the media. It is not strictly in accordance with the judicial procedures to control pollution. Therefore, it’s success for the event itself, but the processing of the event is a failure.